Agonia is a musical project designed and composed by Rui Vrt(drums) and the live colaboration of Daniel D. in voice and low guitar, and Gilberto F. in high guitar. 3.You refer to your music as ' cataclysmic doom metal', can you tell us a little bit more about this term? I try to create an emotional cataclysmic event in the souls that listen, imploding and exploding dark emotions. I has no lyrics..the subjects are agony , emotions of despair, psychologic dissolution , pain, and cataclysmic emotions of epic proportions. 5.What is the meaning and inspiration behind the name 'Agonia'? 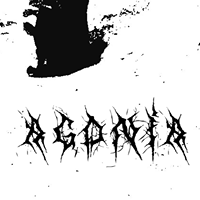 Agonia means Agony . the meaning and inspiration are despair and pain felt . Shows like shelter nights, labyrinth doom fest (oporto), Under the doom Fest (Lisbon) , were all great shows because the show is an emotional display of sound and its like a meditation for us. The international bands with whom we played like marche funébre or mourning beloved really enjoyed the show. That’s the only feedback we have. Heading to the abyss of doom. For eternity. Stay down, and then explode.